Did you know that the U.S. used to have a designated National Thrift Week? It lasted 50 years ending in the 1960’s. There’s an organization that wants to bring back thrift week. 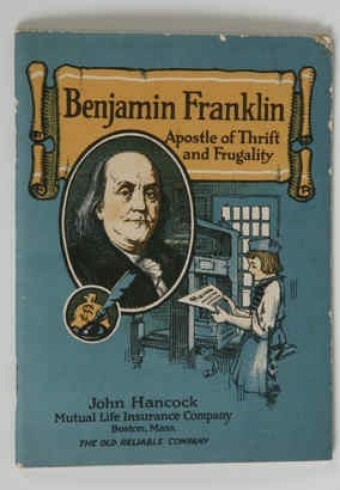 During the years it was observed, National Thrift Week started each year on January 17th which is Benjamin Franklin’s birthday. 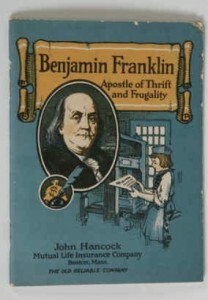 Apparently he was a study in thriftiness (some might say cheap). Each day had a different focus which might include gardening, charity, and so forth. When it started the focus was to make it through World War I but it continued through 1966. Many major American organizations were involved ranging from the Young Christian Men’s Association to Girl Scouts and the American Red Cross. These are just a few of the four pages of specific items. This year the city of Philadelphia relaunched Thrift Week with several activities to encourage thriftiness. I’m not opposed to bringing back National Thrift Week, but I hope our leaders are focusing on much bigger issues such as the high unemployment rate and creating jobs. We can all make being thrifty a personal core value and I think many people have through necessity recently. I also find it interesting that thrift had to be encouraged a century ago. I had the impression that we’d become lax in our habits the last 25 years or so. Instead of a week, let’s make thrift part of our everyday lifestyle. What do you think about having a national week? I agree with you, we should make it a regular part of our lifestyle. It seems that so many people do not understand the concept, it really is sad. Maybe we should have a thriftiness course taught in our schools, like middle school and high school. Brandy, there does need to be more financial information in our school curriculum and I know most parents could do a better job (myself included). Semalee, I love your blog title! I’d be interested to see how effective “Keep credit card companies off school campuses” really is. I have a feeling that most people get into credit card debt as their first “WOAH!” moment, either at 18 or 28 it doesn’t seem to matter much. I agree thriftiness should be a part of everyone’s life! People resist because they think it is all or nothing. A little savings is good for everyone! A high school class in thriftiness would be a great idea – learning to save can never start too early! I agree it should be a part of everyday lifestyle. It’s a good habit to cultivate. Dana, I hope our school system has or adds personal finance education so kids know how to manage money as well as make the most of it. Hi Lisa, thanks for noticing the change in format here. You’re right that anything to raise awareness would be helpful. I wonder why it went away…. I think it is a great idea considering the current state of the economy. I like the idea, but I think you’re right; thrift should be incorporated into our daily lives, not just one week out of the year. I also agree that the government’s focus should be on job creation. Individuals can scrimp and save to their heart’s content, but if they don’t have a job, it’s a moot point! Little House, maybe we’re more focused on jobs than others because California and our neighbor Nevada have been so hard hit. I hope we see a lot of improvement by year’s end.